One of my co-workers loves to ride her bike, affectionately named "Wheels of Fortune," to work every day. This year, I joined her for National Bike to Work Day on May 18. My girls also decided to celebrate National Bike Month with a commitment to ride our bikes as a family at least once a week this year. I'm glad they enjoy riding and support their endeavor because cycling provides many benefits for the whole family. During our most recent family bike ride, we tackled a trail with hills. That ride was tough, but it gave us a new appreciation for how cycling improves our cardiovascular health. In fact, riding a bike can reduce our risk for developing high blood pressure by 31 percent, an important reason to ride often. My mom suffers from arthritis in her knees and can't jog, but her doctor did suggest that she ride her bike. Cycling is a low-impact exercise that's easy on our joints and ideal for riders of any fitness level. Bike-riding strengthens our core and improves our balance, coordination, and flexibility. That means we reduce our risk of strains, injuries, and falls every time we cycle. We exercise more than our legs as we pedal a bike. Cycling works out every muscle group in our body, a good reason to take a ride every day. Obesity affects one in three adults and one in six children. As a family, we can ride our bikes regularly and burn calories, boost our metabolism, and lower our risk of obesity. Physical fitness is important to me, and I want my girls to value staying active, too. This is one reason we ride our bikes together. Now that my girls know how to ride a bike with confidence, they can enjoy cycling and all of its benefits for the rest of their lives. Sometimes, when I notice that my girls are anxious, stressed, or down in the dumps, we'll take a bike ride. Cycling regulates our mood, reduces anxiety, and gives us a mental health boost that helps us cope successfully with life. I love that we don't need special equipment to get a workout on our bikes. We just grab our helmets and go for a ride. I even found our bikes at a yard sale, making this form of exercise even more affordable. Vehicle emissions affect our lungs and damage our planet. Instead of driving to work, school, or local shops, let's ride our bikes. Cycling cuts our pollution exposure, improves our health, and helps us save money on fuel and vehicle maintenance. The thrill of enjoying the great outdoors, spending time together, and seeing beauty around our neighborhood makes my girls and I smile. Every ride offers us a new, fun adventure. Cycling provides families with 10 benefits that enrich our lives now and into the future. Please join us in celebrating National Bike Month all year. 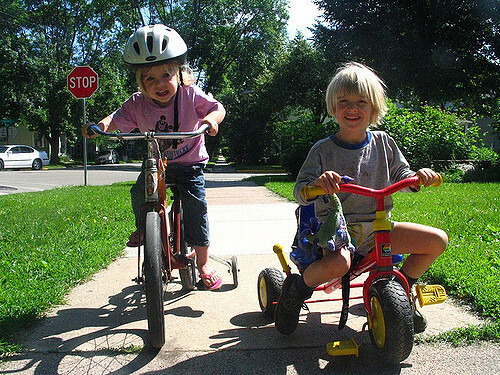 What's your favorite way to maximize your "wheels of fortune" and enjoy biking as a family?